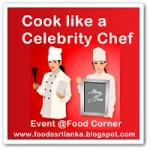 ‘Cook like a Celebrity Chef’ is the new event from Food Corner. Though we cook everyday & share them on our blogs or facebook pages, there are some simple tricks that we can use to improve the quality of the meals. Professional Chefs always use their own techniques to make their customers happy, and keep them coming back. How if we can create a meal for the family, which looks like a meal or dish tasted in a restaurant? 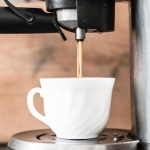 This event is created to try some ideas, recipes & techniques from Celebrity Chefs you admire and to see how your family, guests & even fans/followers of blogs react to your wonderful culinary delights. So, here are the event details or rules/Blog ethics to follow. 1) Cook any dish, which you found in a cooking show/magazine or a website, which is introduced by a Chef. 2) Mention about the Chef in your post & give back links/credits to him/her where necessary. 4) Event duration is 24th October– 30th November. 5) Link any number of veg or non-veg posts using the link tool provided. 6) A link to this event announcement is mandatory. 7) Use of logo is highly appreciated. 8) Entries should be posted during the event period. Archived entries are allowed if they are re-posted & updated with a back link to this announcement. 9) Entries with most views will be featured in Pinterest & Food Corner Facebook page time to time. 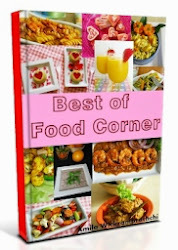 10) If you become a follower of Food Corner, then leave a comment. I can follow you back. I cant wait until I see your entries!! Cook like a Celebrity Chef! & enjoy this event. Sounds like a great idea for an event. Happy hosting. Have a sandwiches and burgers event on, pl do join in. Wow what a professional event.. Will participate.. are archived posts allowed? Archived entries are allowed if they are re-posted & updated with a back link to this announcement. Wow.. sounds interesting. will def try to participate! Wonderful event with truelly a professional look. Surely send my entries soon dear. Happy hosting Amy. I Haven’t yet tried chef recipe to be Honest,But my Mom is my chef 🙂 I have Link few recipes if that ok.
Nice theme! First time here. Would definitely participate. Fun theme ! posted my first entry..Will post more 🙂 Thanks for the opportunity. 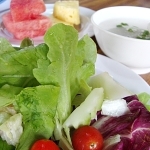 First time to your space thru your food blog page…Happy to follow you :)…like to link my recipes…. Very interesting event, first time here, you got a wonderful space!!! Excellent theme. I have been MIA from the scene for quite some time now. But the theme is one to pull me back.. count me in.! Will link my entry soon..! Wow whata delicious event. Thanks for your comment at my place. 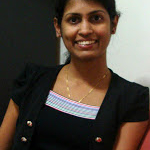 I really treasure it as u hav eliked the styling. fist time here.wil participate from next event.happy to follow u.